For those of us who are advocating for cleaner and greener ports - including the reduction or elimination of cancer causing and otherwise harmful sulfur, nitrogen and particulate emissions from ship and truck smokestack pollution and the reduction of the negative health impacts that the activities of ports have on the residents of port cities and, most acutely, on the residential neighborhoods that the ports abut - the recent news that there is a possibility for the successful adoption of an Oil Industry bankrolled initiative on the ballot in California this November - Proposition 23 - is a worrying development. Proposition 23 (given the rather Orwellian title, "California Jobs Initiative") is an attempt to roll back California's Clean Air Law - AB32. 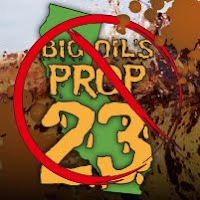 "Prop 23" is sponsored by Valery Energy and Tesaro, two Texas based Oil refining companies, as well as by David and Charles Koch (pronounced "Coke"), the billionaire brother owners of the oil giant Koch Industries, who have also financed the dissemination of climate change misinformation, fought legislation to address climate change or reduce pollution, and successfully lobbied the EPA to refrain from naming formaldehyde, a chemical produced by Koch Industries, as being a "known carcinogen" - which it is. The Koch brothers have also been involved, though keeping a low profile, in other political activities including their support of the "Tea Party" and establishing "grass roots" organizations such as "Americans for Prosperity", a group that opposed health care reform. Their many activities were detailed by Greenpeace earlier this year in a report titled, "Koch Industries: Secretly Funding the Climate Denial Machine. ", and more recently in Jane Mayer's revelatory article in the New Yorker, "Covert Operations: The Billionaire Brothers who are Waging War against Obama". There are many troubling things about Prop 23, and not only that it aims to wind back greenhouse gas regulation enacted in AB-32 - a law that, as the LA Times reports," is designed to cut the state's emission of greenhouse gases to 1990 levels by the end of this decade" with a significant chunk of these reductions coming through "regulations aimed at fostering alternative fuels and generating electricity from solar, wind and other alternative energy sources." If the attack on greenhouse gas reduction/clean energy legislation wasn't troubling enough, the worry is that the adoption of Prop 23 will have flow-on effects to other anti-pollution measures that are in place in California. One of these may be the many clean port initiatives that have been implemented in California over the last number of years, including the initiatives to connect cruise and container ships to "shore power" while they are in port, allowing them to turn off their extra-dirty diesel burning engines (a practice called "cold ironing") instead of "idling" in port - as ships do in Red Hook, Brooklyn and throughout the Ports of New York and New Jersey, for example. Policy experts believe Proposition 23, which seeks to suspend AB 32, California's landmark greenhouse gases law, could have significant impacts on recent measures passed to curb port emissions. Among them are rules approved or pending by the California Air Resources Board to slash emissions from ships, trucks and trains - pollution generators blamed for thousands of cancer and heart disease cases annually in communities surrounding San Pedro Bay. For example, the Air Resources Board in late 2007 adopted a plan requiring that ships turn off their auxiliary engines, use exhaust filters or plug into electrical outlets while visiting ports. That measure could be suspended under Prop 23. As for the health impacts of AB 32's suspension, a nonpartisan report estimates Prop 23 would probably lead to increased hospitalizations and public health costs. The study was issued by the California Legislative Analyst's Office. "Suspending some (CARB) measures could halt air quality improvements that would have public health benefits, such as reduced respiratory illnesses," the report notes. "These public health benefits translate into economic benefits, such as increased worker productivity and reduced government and business costs for health care." The ports of Long Beach and Los Angeles are considered the largest fixed source of emissions in the state, with freight ships alone spewing more than 400,000 tons of carbon dioxide - a greenhouse gas - into local skies in 2008, according to the South Coast Air Quality Management District. Port pollution is also a prime reason why children in communities around the ports suffer from the highest asthma rates in California. As for potentially life-threatening illness, the ports are again a top contributor. Numerous epidemiological studies show about 1,200 out of every million people locally develop cancer from air toxins during their lifetime. However, the federal government lists the "acceptable" cancer rate from air pollution as no higher than 10 in a million. Another article in the Press-Telegram, by Art Marroquin, conveyed the information that an updated "Clean Air Action Plan" for the Ports of Long Beach and Los Angeles was "expected to reduce the risk of cancer from port-related diesel emissions by 85 percent over the next decade". If the previous reporting is right, these potential savings in human life and health costs will also be under threat if Prop 23 is adopted. This is truly troubling, and if the proponents of the status quo, polluters and protectors of 'oil profits at the expense of human health' that support Prop 23 are successful, it doesn't bode well for the expansion of such pollution mitigating and life saving measures in other port cities outside of California, including ours. For example, the "Clean Truck Program" that has been started in California was challenged in court recently, but the supporters of the program won (article here) and that program will continue - for now. There's also a similar program being proposed for the Ports of New York and New Jersey, initiated by Rep. Jerry Nadler, with the legislation being written to hopefully avoid such litigation. This was a matter that was extensively discussed in the New York City Council's Committee on Waterfronts' hearing convened in June titled, "Oversight - Clearing the Air: Greening New York City's Working Waterfront". My post here. (A full transcript of the hearing can be found at the NYC Council site, here). So we have to make sure that Proposition 23 doesn't succeed - doesn't get in the way of these green port initiatives - and make sure that the people who are funding it and the politicians who support it, like California's Assemblyman Dan Logue (story here) and others, know that we know what they're up to. If Prop 23 is defeated and California can succeed in reducing greenhouse emissions, while also reducing harmful emissions such as the type created by the activities of ports - including sulfur, nitrogen oxides and particulates from dirty diesel burning ships, trucks and trains - then we can all hope for such much needed improvements in our port cities and look forward to the accompanying health benefits to our port-side residents.